Thread veins are tiny blood vessels that run close to the surface of the skin. They look like little blue, purple or red wiggly lines, and are visible. Also known as spider veins or broken veins, thread veins are a common problem that, although harmless, can cause the sufferer to feel extremely self-conscious. These spider veins are like varicose veins but smaller. And, they can look like tree branches or spiderwebs. They can be very unpopular, especially with women (as they are more prone to them) because they can look so unsightly. However, there is no reason to suffer with this potentially embarrassing condition any longer. Thread veins can be the result the ageing process (because as we age our skin and blood vessels become less elastic), exposure to the sun, hormones or simply genetics. 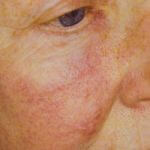 The condition generally occurs when small blood vessels are permanently dilated, called Telangiestasias. The good news is we’re local and offer three successful thread, spider and broken vein removal treatments. The Harmony XL is a laser treatment that offers effective, long-lasting results without major side effects or complications. You will see an overall improvement in the appearance of your skin; its texture and the colour will be smoother and more even. Experience nothing but joy with this non-invasive skin treatment. This treatment is specifically designed to treat thread veins on the face and neck ONLY. How it works: The treatment is quick, at only 20 minutes per session. It works by exposing pigmented lesions to short light pulses. The pulses of light sharply raise the temperature of the skin, enough to breakdown the cells containing melanin. The body then uses its natural healing process to replace these cells with new cells. This eliminates skin discolouration and the appearances of veins is dramatically reduced after just one treatment. The Harmony XL Laser is a quick, pain-free, available for all skin types and no anaesthesia is required. Thermavein is a Microwave treatment that offers instant, safe and permanent removal of thread veins. This treatment is effective and offers consistent results with no known-side effects. It has a very high safety rating and is a great alternative to laser removal treatments. Results with Thermavein are immediate and consistent. Unlike our laser treatment with Harmony XL, this treatment can be used to treat thread veins that occur on the face and the body. How it works:The treatment for face veins is simple; the Thermocogulation process is administered to each vein individually using a fine skin probe. Thermavein delivers a tiny microwave current which travels 1.5mm into the treatment area. By exposing a pigmented lesion to a short light pulse, the temperature of the skin is raised enough to breakdown the cells. The technique seals off the offensive vein walls, causing the vein to close and the vein to permanently disappear. A typical treatment usually takes 15-20 minutes and immediate improvements in the condition can be seen straight after. Sclerotherapy is a saline treatment option for thread veins visible on the body. Sclerotherapy is safe, effective and painless procedure to treat the problem. This treatment has been evolving for over 150 years. The process itself is quick and basic, and recovery time is minimal. How it works: A salt solution or a Sclerosing agent is injected at several points along the veins. The solution irritates the lining of the veins which cause the vein walls to collapse and fade over a period of 2 – 8 weeks. Following the injections, it is important that veins stay in a collapsed state, therefore cotton balls and a compression wrap need to be applied. This helps to promote proper healing and help assist shrinkage of the veins. Overtime the body absorbs the veins and the appearance is significantly improved – resulting in much clearer, vein free skin. The number of sessions required for maximum results will depend on the variety of factors, from thickness and length of the veins being treated, to the individual’s age or health and this treatment can take between 30 minutes to 1 hour. – Relieves aching and pain. As you can see we have multiple options for you to choose from if you suffer with thread, spider, or broken veins, and would like them removed. If you have visible veins in any of the commonly affected areas then you will benefit from our treatments. The best way to determined the most effective one for your condition and veins would be to book a free consultation. Although the exact causes of thread veins and spider veins are not known there are many reasons as to why they appear. Hereditary factors, heat, alcohol and hormonal changes are all thought of as triggers for this skin condition. – The face – nose, cheeks and chin. – The body – legs. For more information regarding a consultation or any of the treatments listed in this article please contact our clinic or call 01708 225 555.